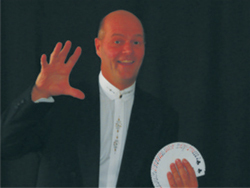 Ken McCreedy has been active in the Art of Magic since the early seventies. With his unique blend of sleight of hand, comedy, illusion and audience participation, he has entertained and amazed literally thousands of people world wide. Whether it is on T.V. or on the stage in the United States, Bahamas, Bermuda, Japan or Canada, this dynamic performer always leaves the audience asking for more. Since the early eighties, Ken has been the resident magician at the World Famous Henry VIII Feast in Niagara. Ken is an award winning magician and has also created magic and stage illusions for some of today's most contemporary performers. His creations have appeared in the International Brotherhood of Magicians Trade Paper as well as Japanese and French periodicals. One noted magic columnist says " he does some great comedy magic. Come to think of it, if you see Ken's name mentioned anywhere go see him...stage, close-up or comedy he's equally skilled in all fields. Plus he's one of the nicest people you'll meet in the world of magic!" A distinct entertainer with a flair to captivate any audience! !